At the beginning of the past three years I’ve identified a number of projects I’d like to complete through the year. You can see the previous annual lists in the menu up at the top of the page – under a year of projects. This year I’m still doing an annual project list, but it will be little different. Because I’ve committed to the rather ambitious 50before50 project over the next 2 years, it is nuts to even supposed that I could do that AND work on a huge annual project list. So, this year I’m focussing mostly on the 50 list, with a couple of what I hope are achievable extras. 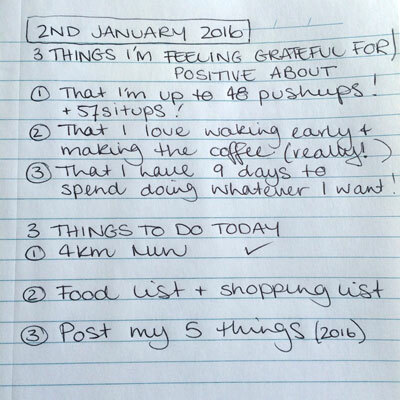 each morning list 3 things I’m grateful for/feeling positive about and 3 small things I’d like to achieve. This will be in hard copy (see below), I’m not going to inflict that on you every day! Oh I definitely agree about the narrowed reading! I’m sure there are really great blogs out there – but how does one find them? I’ve discovered a couple of new (to me) really good niche blogs this year – from the GOMI forums of all places – but I try to avoid going there generally because there is only so much fat, jealous, hatery that I can tolerate!